Navalny brothers Yves Rocher embezzlement case submitted to court | Russian Legal Information Agency (RAPSI). MOSCOW, April 11 (RAPSI) - The Russian Prosecutor General’s office has referred a case against opposition activist Alexei Navalny and his brother Oleg to Moscow's Zamoskvoretsky District Court, the office announced Friday. The brothers are accused of having defrauded cosmetics company Yves Rocher Vistok and the Multidisciplinary Processing Company of funds between 2008 and 2013. The overall damage is expected to be in the vicinity of 31 million rubles (over $870,700). The funds were allegedly laundered through the Kobyakovsky basket weaving factory, which is thought to be controlled by the Navalnys and their relatives. 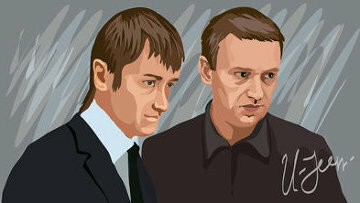 Russian media outlets have reported that the company is owned by the Navalny brothers’ parents. Moscow's Zamoskvoretsky District Court adjudicated another case against Alexei Navalny, in which he was convicted of embezzlement in relation to timber operations in Russia’s Kirov region. He was handed a five-year suspended sentence over the summer in connection with the latter case. 18:30 11/04/2014 The Russian Prosecutor General’s office has referred a case against opposition activist Alexei Navalny and his brother Oleg to Moscow's Zamoskvoretsky District Court.